Transportation is an essential part of how we get things done. Most of the errands we run in our regular daily lives involve short trips. Those trips can often be done more easily by bicycle, and yet, most are not. Sometimes we need a little nudge to help us see how easy it can be. Enter the Errandonnee: a challenge organized and led by the woman behind Chasing Mailboxes and Coffeeneuring. 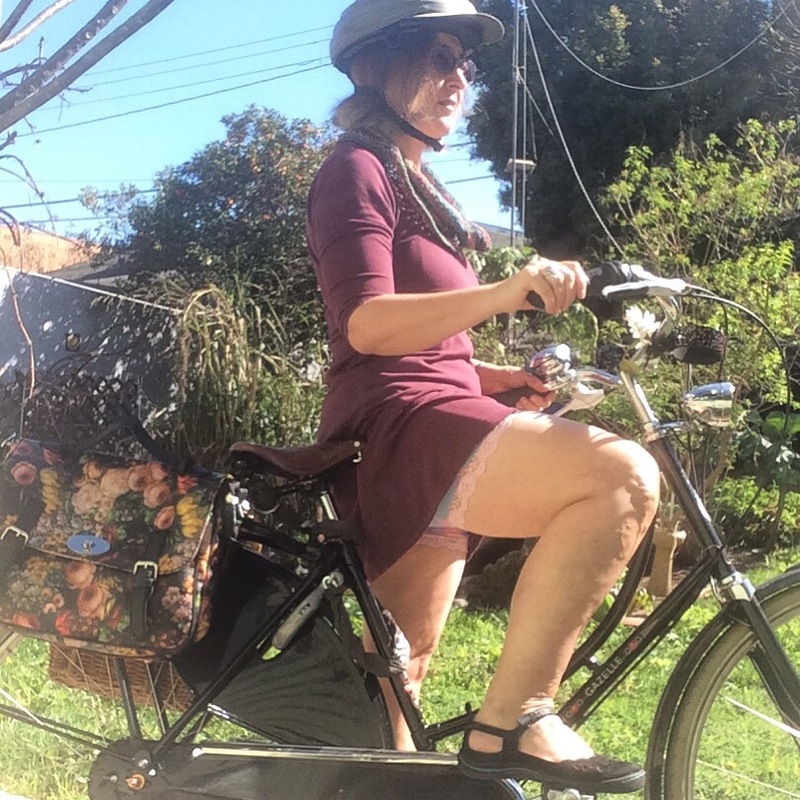 She’s a randonneur, and loves to meld concepts to create new terms to describe her cycling challenges, which serve to encourage folks to keep biking during the off season. 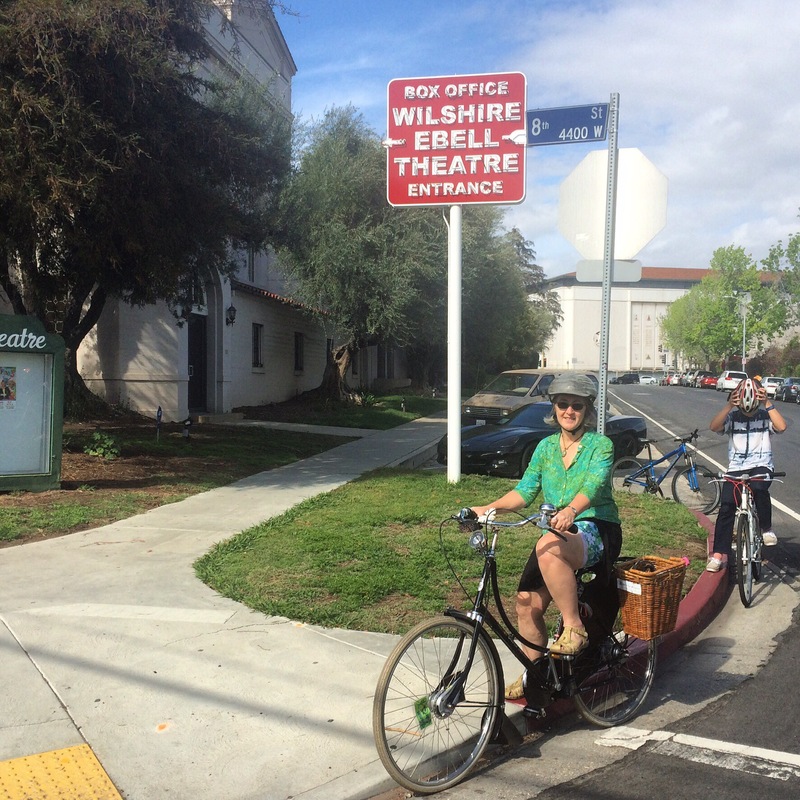 Errandonnee is a fun play on the combination of “errand” and “randonnee”. Like a randonnee, the errandonnee has a set of rules participants are to follow in order to successfully complete the challenge and document their achievements. For this one, participants must complete 12 errands over the course of 12 days, March 20th-31st. The errands must fall within at least 7 of 10 categories, and no one category may be used more than twice. It is permissible to carry out multiple errands in a single day, and there is no minimum mileage per errand. One need only report the total mileage for all 12 errands, and that total must be at least 30 miles. As if all that fun isn’t reward enough, you can even get a patch! This is now my fourth year taking on the challenge. I have found that it is really quite doable, provided I set aside a little time for planning to make sure I hit a sufficient variety of categories. It’s easy to hit the “work” and “store” categories, and I have learned to let my dry cleaning (of which I tend to have very little) pile up so I can take it in as a “non-store” or “personal business” errand. Also easy is “personal care”, as I can always count a recreational ride in that category. Going to an event or meeting a friend for dinner is an easy “social call”. The category that entices and intrigues me, is the “you-carried-WHAT-on-your-bike”. Some errandonneurs have come up with remarkable feats of bicycle transport of sizable loads, and I would love to make my own mark in that category. But, no, I’ve managed nothing more than a giant load of dry cleaning, or several bottles of wine. Perhaps this year I can redeem myself. Then again, perhaps I should just concede this category to one of the cargo bike riders. Let’s see now, what did I leave out? Other categories are: “arts & entertainment”, “wild card”, and a new one, “peaceful everyday actions”. Yesterday (March 21st) I pulled out my calendar to consider the activities already planned or under consideration, and began making a list of places I’m likely to bike to in the remaining days of March. My list was pretty easy to make. I’d had already taken care of three errands, with two in the “work” category (yesterday’s and today’s commutes), and one run to the “store” on my way home from work yesterday. I think my problem this year is going to be figuring out how to keep it interesting and not too easy. Observation: We don’t often get overcast skies here in Los Angeles. I noticed today how much cooler and darker the ride home feels under such skies, even when the temperature is rather warmish. Observation: Those ready-to-eat roast chickens available at the grocery store on my way home from the office are wonderful when you need a simple, easy dinner, plus they are easy to carry in a bike basket! Observation: Although the logistics involved in selecting, organizing, and sending samples out of state, plus coordinating with the recipient, are cumbersome and overwhelming, the excitement of having my Bloomers appear in a Bike Fashion Show (at the Pedal Power Bike Expo in Olympia, Washington) is exciting enough to make it all worthwhile! Observations: seeing families marching together for safety gives me hope; buying fresh produce makes me want to take better care of myself; and seeing people who give their time to help those in need makes me want to be a better person; I really appreciate it when the authorities close off downtown streets from cars – what a great way to ride through downtown L.A. Observation: pushing myself (and failing) to climb longer and steeper hills than I can (on the 3rd super-climb, I had to walk the last part of the hill) is still an important part of my self-care — it tells me that I really did do my best, and gives me a goal for next time (I’m so impressed with my ride, I took a screenshot of the route as recorded on Strava); biking to Stories later that same day was still possible even though my legs were feeling it! Observation: every time women get together, amazing conversations and connections happen! Observation: getting up early and heading out on the bike when it’s still cold and dark may be painful, but the fun of riding on a car-free path (Ballona Creek Bike Path) and socializing over coffee makes it all worthwhile. Must do this more often. I must give credit to a new bike friend, Audrey, whom I met on the group training ride that was #9. She was eager to meet other members of the local bike community, so I had extra motivation to make #11 and #12 happen. Both of these require a certain commitment to getting up early so I can make it to a meeting that is a half hour or an hour from home. Knowing that someone else was expecting me to show up and make introductions prevented me from making excuses or backing out. Thanks to my thoughtful advance planning for this year’s errandonnee, I knew that my 12th and final errand would be the March 28th social call to join the folks at Camp Coffee. I’ve been wanting to increase my biking miles this year, and nudging myself to get up early for Camp Coffee is a great way to add a chunk of miles int he middle of my week. So, when a few additional errands presented themselves before that day, I decided to treat them as “bonus errands”. Beside, I just wasn’t ready to be finished so soon. It’s too much fun to just tick each one off the list and stop. Observation: I like maintaining a good relationship with the owner of the shop where I bought my Bianchi last October, and I like maintaining my bike. I’m not so good at the DIY approach with the updated technology since my youth, so I’m happy to have the mechanic make sure it’s done right. After a gentle fall on the group ride the day before, I was concerned that something might be a little off, so I had him check it for me. He said only the rear brake was in need of a little adjustment, but everything else was fine (I’m always nervous if the bike falls to the derailleur side). Since he didn’t charge me for it, I used this as an excuse to buy a spoke light so I’ll be ready for my next nighttime social ride (when all the cool kids light up their bikes). Observation: It is important to participate in civic discussions when we know there will be NIMBYs and nattering nabobs of negativity trying to shut down any change. The meeting was to discuss a proposed new development immediately adjacent to our lovely historic neighborhood. I don’t like it when developers get waivers to get around all the zoning requirements designed to preserve a neighborhood’s character (as often happens in L.A.), but I also don’t like it when new housing is perpetually blocked by NIMBYs who want it to be done elsewhere. That’s how we end up with urban housing crises. I was happy to learn that, despite all the angry neighbors complaining about the project, the developers have taken a very progressive and “green” approach to their proposal. They are including more set-back, more off-street parking, and fewer units than zoning allows, plus they will include electric car sharing and bike parking, and amenities aimed at attracting families. I couldn’t bring myself to snap a photo of the actual meeting – it ran so long, and I just wanted to get the bleep out of there! My only photographic evidence shows one of the yard signs announcing the meeting that I passed as I was biking over there. Although I listed this bonus errand under the “wild card” category, it inspired me to propose a new category for next year: “civic engagement”. Attending meetings like this, working for safe streets and bicycle infrastructure would also count. Many of this year’s errandonneurs, including myself, also participated in a public march to voice concerns about civic issues (in this case, gun violence). It seems to me, we could support a separate category for these activities. So, TA-DA! There it is: another successful errandonnee challenge completed! Total mileage for all errands combined was 40 miles. Even if we subtract the 4.5 miles of “bonus” errands, it still easily meets the 30 mile minimum. The question for reflection: was that a challenge? Can I call it a challenge if I had so much fun just doing activities I (mostly) would have done any way? I think so, and for two reasons. First, it was still a challenge to plan and organize how I would hit the variety of categories and fit it all in to the 12 days. Second, I know that I biked more miles and did more social activities than I would have without the errandonnee challenge influencing my decisions. I see no reason why that fact that I finished ahead of schedule and had a blast doing it should negate the accomplishment. Once again, thank you, Mary, for the inspiration! And thank you to the fellow errandonneurs for their inspiring posts shared on Facebook and Instagram. A great way to grow my network of bike friends. I am so excited for my new patch! For my third time, I took on the Coffeeneuring Challenge, which is now in its seventh year. Successful completion of the Challenge requires some reporting, which brings me to this post. I find that it’s one thing to share a few photos in near-real-time for each adventure to the Bikie Girl Bloomers Instagram account and to the Coffeeneurs Facebook group, but I’ve yet to master the art of writing up a complete blog post soon after each ride, as some of the expert Coffeeneurs do. (I tell myself they must be retired, although that’s probably not the case.) I like to use the blog to present my full report, as my social media posts often leave out one or two of the required details, and I refuse to let the reporting get in the way of the actual experience! Coffee-whatting you may ask? Click here for more complete information on this annual 6-7 week challenge during which participants visit 7 different coffee shops (or create their own special coffee shop experience) and report back on the distance traveled (a modest 2 mile minimum per trip), the bike-friendliness of the shop visited, and the coffee-ish beverage imbibed. It’s a fun way to keep the joy of bicycling as autumn weather sets in, and a great resource for learning from fellow cyclists about places to try new coffee-ish beverages. Best of all, it’s a wonderful way to experience community with fellow lovers of cycling & coffee around the globe. Sometimes I see posts from folks living in places I once lived, and it gives me a warm, fuzzy feeling of connection. Other posts make me want to add new destinations to my ever-growing bike-it list. Each of the rides reported below was planned in accordance with my chosen theme for the 2017 challenge: The Donut Quest. Coffeeneuring is a theme unto itself, but participants are welcome to introduce a theme within a theme at their discretion. I love themes, and not much thought was required to arrive at this year’s theme. It was inspired by an article listing the best donut shops in the L.A. area that appeared in the Los Angeles Times on September 8, 2017. I knew right then and there I just had to explore these donut shops for myself. I don’t make a regular habit of eating donuts. I’m more the type who doesn’t mind eating a donut if someone is offering one, but it’s not the sort of treat I regularly seek out. Somehow that made it appealing as a theme for my coffee rides, as it presented me with an excuse to explore something I otherwise wouldn’t. It seemed “safer” to explore donuts in conjunction with bike rides, as well, given that I would stand a better chance of burning most of the unnecessary calories one consumes when eating donuts (I figure I need to ride at least 10 miles per donut). I also like to explore different parts of the sprawling Los Angeles metropolis on my bike, and so I liked that the L.A. Times list included donut shops spread far and wide. I know I can get a little chatty at times, so if you find my descriptions a bit much, you can get a summary of all my rides by scrolling from one bold-faced list of bullet points to the next. For me, choosing my route, encountering friends or foibles, discovering new things by bike, are all part of the joy of my urban bike adventures! Why do I include in my report which bloomers I wore? Well, you must understand that I wear them nearly every day, and this is my passion. And now, here are my 7 coffeeneuring/donut rides. Several of the donut shops on the LA Times list are not far from my home, and Bob’s in particular is in a familiar location: the Original Farmer’s Market at 3rd and Fairfax. This market goes back to 1934, when some depression-era entrepreneurs thought it would be great to have a village-type experience where farmers could offer their fresh produce. The market includes a large number of permanent stalls, and includes a variety of merchants, not just farmers, where shoppers can buy everything from produce, cheese, and meats to toys, postcards, and gifts, as well as enjoy prepared foods from a large selection of restaurants. On the day I visited, I was treated to live music as well. Since Bob’s is only a nudge under 4 miles northwest from my house, and the ride to the Farmer’s Market is rather familiar to me, I first had to consider how I might make the route a wee bit more interesting, and a nudge longer to meet my 10-mile minimum. Lately, I have been intrigued with working on a better route for riding parallel to Pico Boulevard, just a little south of me. Google maps always seems to think biking on Pico is acceptable, but trust me, it’s better to find alternatives, or at least be ready to use the sidewalk. So I zigzagged my way west and south, until the point where I needed to drop further south in order to be able to cross La Brea, a major north-south arterial that would be suicide to cross without a traffic light. For that, I had to leave the otherwise quite suitable 12th Street, and head south on Longwood to San Vicente, a street that angles northwesterly, and where a bike lane offers some protection from the fast-moving traffic. 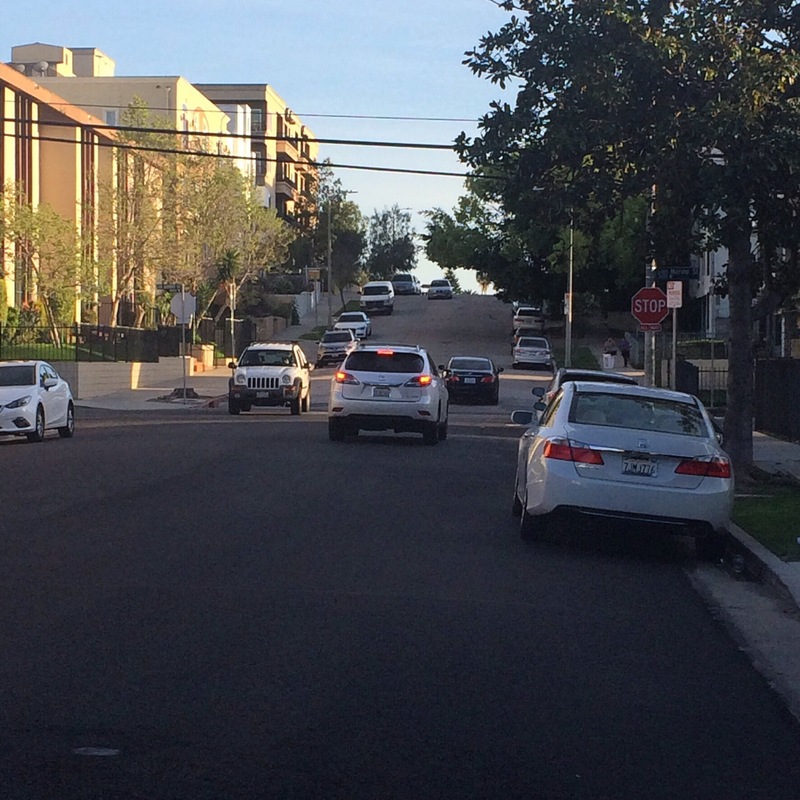 This street gave me a token hill to climb (does a ride really count if it’s completely flat? ), and then carried me all the way to Cochran, a rather bike-friendly street for heading north through MidCity. This got me to 3rd Street, a street with whom I have a conflicted love-hate relationship. Sometimes I just take the lane, because there are some places you can’t get to except via 3rd Street, and why shouldn’t I? Sometimes (especially at night) I ride on the sidewalk. Today, I took the lane, but the stress of it wore me down, and when I got to the last long block, I hopped over to take advantage of the paved path along the outside edge of Pan Pacific Park. Then I faced the intersection that screams “NOBODY RIDES A BIKE TO THIS PLACE! !” It’s the access point to The Grove, the Disneyland-meets-Vegas of shopping malls, which was developed, quite intentionally, directly adjacent to the Original Farmer’s Market, creating a fascinating juxtaposition of authentic character and faux glitziness. This intersection is horrible because a continuous stream of automobiles is turning onto the very street I need to cross to access the shopping area, and they are turning from both the westbound and eastbound directions of 3rd Street. This means that, even when the light is green for bikes and pedestrians heading west to the mall and market areas, the threat of a right hook is ever-present. And it’s not as though routing yourself to the area from the north or the west would help, as all of the bordering streets are horrible. Would you like to bike here? Despite all the intimidation designed to discourage biking to this place, there is a refreshing abundance of bike parking at the Farmer’s Market (and also in the parking structure for the mall, for those wondering). I locked up my Gazelle, and began strolling though the Farmer’s Market, looking for Bob’s Doughnut shop. One can easily get lost in this place. There are a couple dozen merchants in addition to over 30 restaurants in this place, and the somewhat narrow aisles between stalls can get crowded. I found Bob’s and gawked at the doughnut selection, trying to remember which one the LA Times had recommended. I asked the server what she recommended for a person trying this place for the first time. She suggested the apple fritter, or the cinnamon bun, as well as the classic glazed, but that bun looked good to me. Since it was a hot day, I went for the ice blended mocha as my beverage, and took my treats over to the other end of the market, where a live band was performing. Between the people-watching and the music, it was a lovely place to enjoy my treats. The cinnamon bun had all the delightfully light texture and sweetness of a quality glazed donut, with just enough cinnamon to qualify as a cinnamon bun. I liked that it was not the kind that gets gooey by the time you get to the middle (although that type of cinnamon roll has its place). I tried to mark the occasion of my opening entry into this year’s Coffeeneuring series with a ceremonial dunking of my donut in my drink, but that turned out be be a bit awkward, given the size of my cinnamon bun and the thick texture of my drink. This would surely work much better with a normal donut and a normal cup of coffee. But it’s just too hot and sunny on this Saturday afternoon in Los Angeles, so I could not imagine drinking a hot beverage today. Although the ice blended mocha offered an element of refreshment, the blended part was a bit too thick, and it wasn’t something I would order again. A simple iced coffee would have been a better choice. I took advantage of being at the market to get some necessaries for home. I don’t normally patronize butcher shops, but thought it would make for a nice treat for el Cochinito and me to get some quality goods for our dinner. He has a thing for pork chops on the bone that are sliced more thinly than the usual way they are provided at the grocery store. I asked the butcher if he could cut some to about half the thickness of the pork chops in his display case, and he obliged. I had never watched pork chops being cut before. It was a surprise for me to see the huge piece from which the chops were cut. I also got a few other choice items from the case, and then went over to the produce market, making sure I knew how much room remained in my basket before I got too carried away with the vegetables. It turned out I was able to fit quite a good bit of loot in my pannier basket. It occurred to me that I could try avoiding the stress of biking on 3rd Street by heading north out of Pan Pacific Park, which is just across the street that borders the west edge of the Farmer’s Market and The Grove shopping mall. It was a nice day to ride through the park, passing children on the playground and men playing soccer. I enjoyed heading east on Oakwood, and adding a modest extra mile or two to my return trip. Perhaps the most rewarding part of this successful first ride to open Coffeeneuring season was the delicious pork chop dinner el Cochinito cooked up for us that evening. My second Coffeeneuring ride of the season took me to Dad’s Donuts & Bakery in Burbank. I was excited for this first Coffeeneuring ride on my new bike, a Bianchi Volpe I bought just a week prior as a replacement for the Specialized Dolce Comp that was stolen the month before. As painful as it was to lose my beloved Dolce – we shared a lot of great memories since I got her in 2004 – it was delightfully exciting to explore my new choice in the road bike category. I had not done any long or strenuous rides since the acquisition, and this was my first test that would really tell me whether I’d made the right choice. The Volpe did not disappoint. One donut shop that made the LA Times list was in Burbank, a city over in the San Fernando Valley (aka, “the valley”), a place I don’t visit often, and a place that it is easy to turn one’s nose up at from my side of Mulholland. In fact, my only real exploration of Burbank occurred by bicycle during my first stab at Coffeeneuring in 2015, and it gave me a nice appreciation of this suburb to my north. Yes, the valley still has its multi-lane roads that seem to do nothing more than take you from one strip mall to the next, offering little in the way of character, or inviting places to wander, but it also has some nice tree-lined residential streets, and the lovely Verdugo Hills along its northeast border. I happen to like the way you can get to Burbank by biking through Griffith Park, my go-to place for bike rides when I just want to ride without having to plan a route. So I knew where to start for this one, and I knew it would get me a ride with some decent mileage. I love the bike lanes that await me when I head north out of Griffith Park and turn onto Riverside Drive. The road is nice and wide, and pretty, and in addition to the bike lane, there is some special infrastructure for those traveling on horseback. The north end of Griffith Park includes a horse stable, where folks can rent horses, and this is just one of the riding stables in the area. 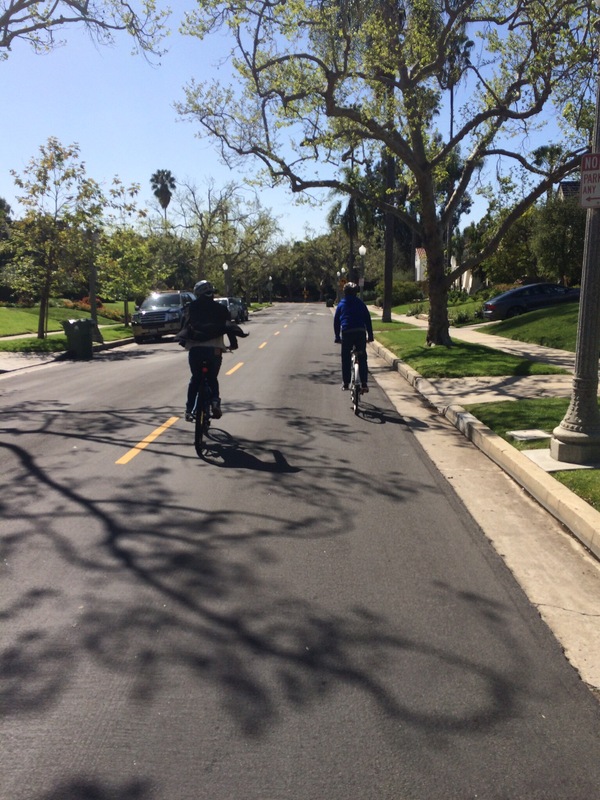 I post some pics of the special separate bike and horse lanes (and signal indicators) in my 2015 post about biking in Burbank. It’s not unusual to see a peloton pass by in Griffith Park – it’s a great place to ride. I didn’t have to go far from there to get to Dad’s Donuts. Like many donut shops, it sits in an unassuming strip mall. I couldn’t find a bike rack anywhere in the vicinity, but I did find a light post secured in a large concrete base. Luckily, I had the heavy duty cable that came with my kryptonite lock, and was able to use that to secure my bike. Although it was less than ideal bike parking, I felt quite confident that my bike would be safe there. Inside I found a wide selection of donuts to choose from, as well as a variety of baked goods, including bagels, muffins, and bread. It was difficult to choose between the Buttermilk Bar, which was recommended by the LA Times, and the cronut, so I got one of each. They were both heavy and quite filling, but anything I can’t finish is likely to be welcomed by el Cochinito when I get home. As if that weren’t enough for my sweet tooth, I once again fell for an iced mocha. This one wasn’t put through a blender, and the “mocha” part was a generous pour of chocolate syrup that coated the sides of my cup. I found it quite refreshing on yet another hot day. 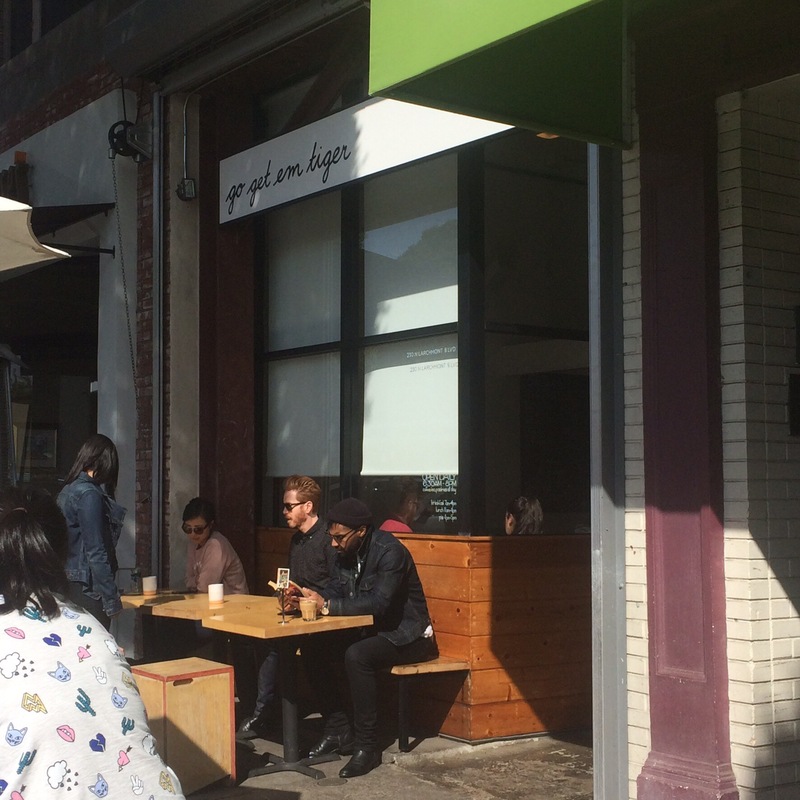 Both the cronut and the bar were delicious, in a super dense and rich sort of way, and I was glad I was having them on a higher mileage day. From there, I thought it would be fun to head west on the Chandler Bike Path, a nicely-paved and manicured bike path that follows along the Orange Line Bus Route. The Orange line is Metro’s way of providing subway-like service with a dedicated bus path that is separated from the main travel lanes that other vehicles use. I have only biked this path twice before, and couldn’t resist an excuse to ride it today. I figured I could take this over to Coldwater Canyon, a road I’ve taken to descend from Mulholland into Beverly Hills many times, but one I was a wee bit nervous about from the valley side. I figured I’d just give it a shot. Did I mention it was a hot day? The high was 96 degrees Fahrenheit, and it was already noonish. I knew Coldwater Canyon would not be the most bike-friendly street, but I took to mentally preparing myself for that, and being ready to use my best urban biking skills. I was feeling the heat, and noticed an ATM, so decided to make a quick stop to get some cash and guzzle some water before I started south toward the climb. I had barely begun the climb when I realized that both the heat and the traffic were bothering me. I noticed a shady spot off to the right, so I pulled over and decided to hydrate some more, and make sure I felt ready to take on the climb. I took a good long rest, and made sure I felt up to it and ready. Although I felt quite re-energized as soon as I started pedaling again, it wasn’t long before the climb began to feel grueling. Coupled with the winding curves, narrow shoulder, and fast-moving car traffic, I was not enjoying it. This seemed notably beyond my current level of conditioning, or maybe I just can’t handle the heat. I decided to give myself permission to stop anytime I saw a space for it and felt the need to refresh myself again. I ended up stopping twice more on the climb, and after I each rest, I had the same experience of a disappointingly short burst of renewed energy. I found myself wondering why I’d chosen such a lousy route, wondering if I’d made a serious mistake, wondering if I was misjudging my ability to handle this climb, wondering if I was going to make it to the top, yet aware that I didn’t have much choice, as walking my bike up that hill would not be any safer. When I finally got to Mulholland Drive, I was so relieved. I was also aware that I wan’t quite exactly sure how I would descend on the other side. I knew that Coldwater Canyon does a shift at Mulholland, where the northbound and southbound portions of this road don’t line up, and that I might be able to descend via Franklin Canyon by turning right somewhere near there, but I wasn’t quite sure where. I saw what looked to be that option, and I turned. I felt so thrilled to be done with that awful climb in the hot sun. Heading down through Franklin Canyon was a welcome treat. It’s just plain beautiful. No more heavy traffic. No more grueling climb. And scenery to savor. Once I took in the beautiful surroundings, I wasn’t mad at myself for my choice of route any more. This was awesome, and tranquil, and just what I needed. From there, I took a fairly direct route back home. I was feeling well aware that I’d done enough for the day, and remained eager to get out of the heat and be done with it. The ride left me feeling spent, but proud (and perhaps a wee bit stupid) that I’d powered through it. District Doughnut, Barracks Row, Washington, D.C. The next week, I was in Washington, D.C., for the American Intellectual Property Law Association’s Annual Meeting. I go to this meeting every October, and last year, while in town for the meeting, I met fellow Coffeeneur Ilga at the Women & Bicycles Coffee Club. We had tried to coordinate a Coffeeneuring ride together during that visit, but our schedules just didn’t sync up. This year, my schedule was more flexible, and so was Ilga’s, so we were able to bike together to District Doughnut in Barracks Row, an area of D.C. I’d not seen before. Ilga’s theme was meeting someone different for coffee each time, and so I was happy to contribute to her series, and glad she was open to participating in my donut theme. The trickiest part for me was finding an available bikeshare bike on this gorgeous Sunday. I had seen all the new dockless bike share bikes out on the sidewalks during the week, and had ridden one of the Mobikes back from a brunch date in Georgetown the day before. I was excited to perhaps get a chance to try one of the other dockless bikes for this ride, but quickly noticed that none were available. I knew I could just walk a short way to get to a Capital Bikeshare dock, if necessary, but those bikes were all gone as well. I walked from Woodley Park into Adams Morgan, and docking station after docking station was empty, and none of the dockless share bikes were around either. I finally found a bike, and grabbed it, deciding I would gladly pay overage charges if necessary in order to hang onto a bike for the full adventure. That one last bike I found, however, was in rather poor shape, and I had a little time before I was scheduled to meet Ilga, so I tried to bike to another docking station near her place that the app showed had some bikes available. The problem was, the area has a lot of one-way streets, and I kept finding myself stuck going the wrong way. After a few frustrating loops, I finally back-tracked a block on the sidewalk to get to it, and made the switch. The new bike wasn’t much better, but I pedaled on, grateful to have a bike at all! Ilga led the way south, toward the White House, and we headed east on Pennsylvania Avenue. I love that bike lane that runs right down the middle of the street, heading towards the Capital building. 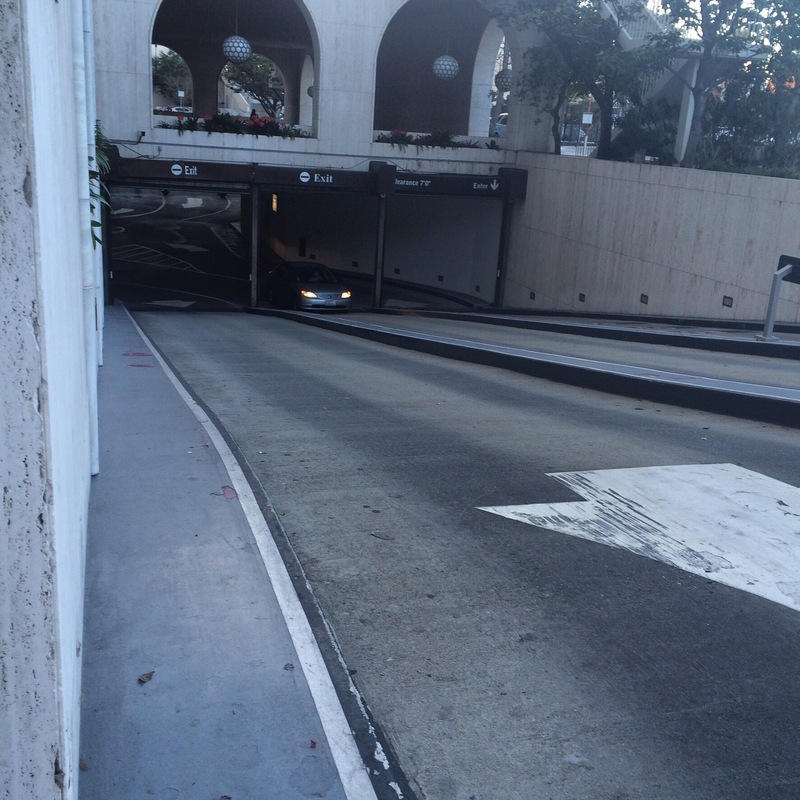 I noticed also that the bike lane has received some added improvements to better protect cyclists from turning cars. That’s the biggest drawback to a bike lane in the middle of the street: you have to guard against conflicts between vehicles crossing the bike lane as they make left turns or U-turns. Barracks Row refers to a commercial district developed in the Eastern Market area of Capitol Hill. It’s close to the Navy Yard and some old Marine barracks, and in the vicinity is a large swath of new developments built in recent years as part of a revitalization effort after the area had experienced decades of decline. The biking was fine, except for navigating around an awkward freeway that cuts through that part of town. District Doughnut is on this cute 8th Street SE, and directly across from the Marine barracks. It’s close to the intersection with I Street, where I was able to dock my bike. There was also a bike rack directly in front of District Doughnut, so Ilga was able to park her bike there. While bike parking was easy, choosing a donut was not. There were so many intriguing choices, I ended up getting four! I had to try to Dulce de Leche donut and the Caramel Apple Strudel donut, and I thought the Brown Butter donut looked good, too. There was also an odd-looking Everything donut. It looked just like an Everything Bagel, and that was the idea. I got that one for el Cochinito, who had joined me in D.C. for the weekend, but was holed up in our B&B for the day, grading papers for his students. He doesn’t have the same sweet tooth I do, so I thought he might like the more savory Everything donut. (I thought wrong, by the way; he thought it looked disgusting, and tossed it!) I think he preferred what was left of the others I tried. For my beverage, I had a cold brew coffee with milk. Ilga had iced tea and some donut indulgence as well. 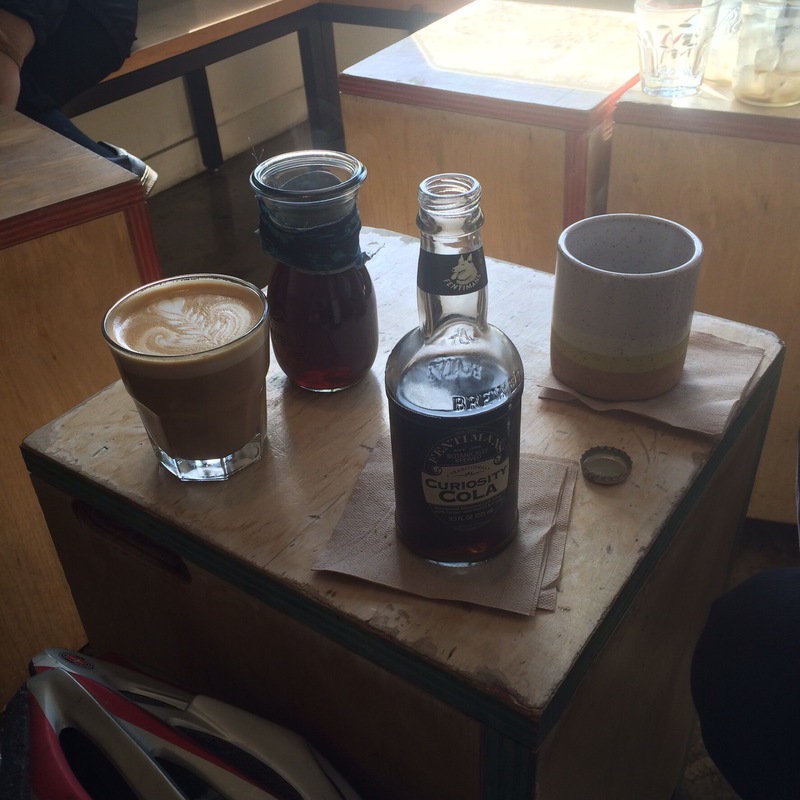 The cold brew was good, and the Dulce de Leche donut was extraordinary. The Caramel Apple Strudel donut was my second favorite. Those two were so decadent, the Brown Butter donut seemed a bit plain, but it may have been overshadowed by the richness of the other two. We had a nice ride back, riding past lots of large new residential towers, and went farther west to check out a new development along the waterfront. There was a huge amount of bike parking in the new commercial district, which looked quite vibrant. I would have stayed and explored with Ilga, but I needed to get back to meet up with el Cochinito for our evening plans. I was nicely positioned, however, to curve up Maine Street to the Mall area, and catch 15th St NW to head north back toward Woodley Park. Control No. 4: October 29 – Double Trouble! Today I doubled up on the donut quest, and tried two coffee/donut shops to celebrate an enjoyable climb up Nichols Canyon. This ride also served as my redemption and reassurance that I can still climb hills, especially when it’s not 96 degrees out. I also got a nice early start this day, because I knew I would have to ride on Mulholland Drive, and the earlier I do that, the less traffic there will be. I also had plans for later in the day, and wanted to be sure I had plenty of time for my climb and my coffeeneuring stop beforehand. Nichols Canyon is one of my favorite climbing rides, but I don’t do it that often (and I don’t do climbing rides that often, which doesn’t help my conditioning or my confidence, and hence leads to less inclination to do climbing rides). It was a nice cool morning, with a heavy marine layer keeping the air damp. I was grateful, as I was itching for a long ride, and did not want heat and sun wearing me down. The climb was immensely satisfying. I was pleased with both my stamina and my new Bianchi Volpe. I wanted this new bike to be suitable for challenging rides and also sufficiently comfortable for longer touring rides (of which I hope to do more). My last road bike was so nimble, and allowed me to feel strong on climbs. I wasn’t sure yet if the Volpe would give me that same feeling. I’d felt so weak on the Coldwater Canyon ride a couple weeks earlier, I needed to try another climbing ride, and one that I could compare to previous climbs up the same road on my old bike. I was pleased to find myself spinning comfortably up the switchbacks, and glad that I never felt strained until I got to that last block up Woodrow Wilson, which connects Nichols Canyon Road with Mulholland Drive. That block is super steep, but short enough that I’ve always been able to muster what I needed to get up it. I was so excited when I got to that point, I just kept my focus on the nearest bit of ground before me, knowing that soon I would be at the top. Once I got there, I was certainly very winded and in need of a rest, but thrilling in the triumph. I rode along Mulholland, grateful for a clean shoulder to ride on and a fairly low traffic morning. I’d noticed my rear brake was still squeaking as it had when I first brought it home from the bike shop, so I decided to stop at one of the pull-outs and adjust it before I get to the downhill part of my ride. The place where I pulled off had some pretty cacti, so I made that the backdrop for my proud-moment-bike-portrait. Normally, I would snap a photo with the view of the valley, but the marine layer was still thick enough to completely block that view. I was able to get rid of the squeak from my brake and get on my way. I like to descend from Mulholland on Coldwater Canyon. This drops down into Beverly Hills, which has nice, wide streets lined with big trees and mansions to gawk at, a part of the ride I always enjoy. 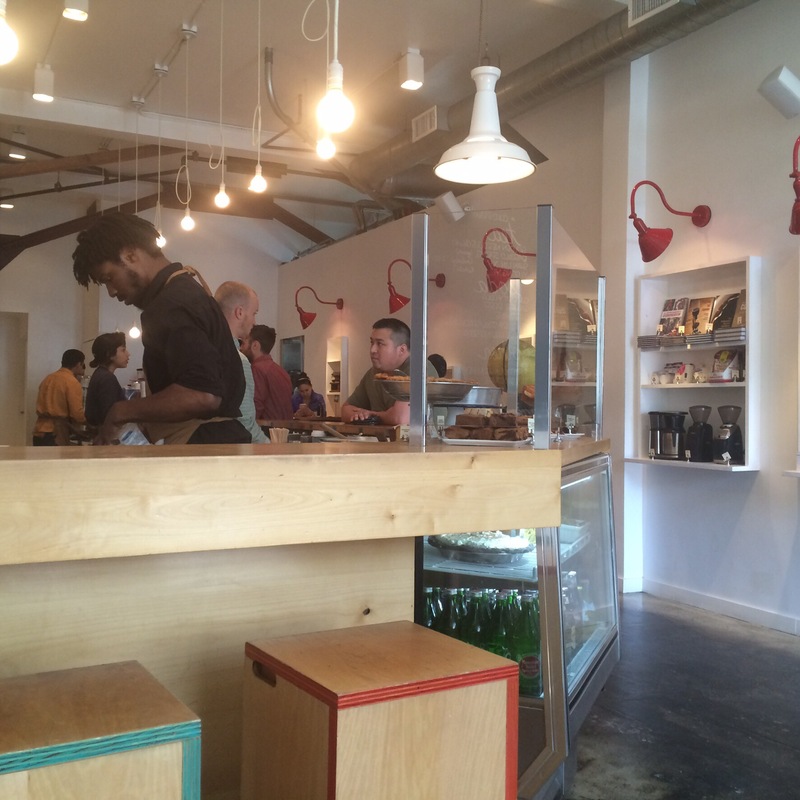 From there, I made my way to the Fairfax district, to visit Cofax Coffee and taste their cornflake donut. It tastes better than it sounds. It was actually light and fluffy, compared to some of the densely rich donuts I tried on other rides. The cornflake topping is not overdone, nor is it overly sweet. It was a light, delicate donut with a little sweet, crunchy topping, rather than being all about the cornflake idea. The macchiato I had with it was good, and it was nice to have a warm coffee drink on a Coffeeneuring ride for once. Somehow that feels more legitimate. Cofax is a tiny shop, and I felt very lucky that I was able to get one of the two seats at the window, facing the street. The place has very little seating, and most of it is in the midst of the line of folks waiting to place their orders. Fairfax is not a bike-friendly street, but I was able to ride on the sidewalk as needed, and to park my bike at a good rack right in front of Cofax Coffee. I had kept my plans fluid, not knowing how I would feel after the Nichols Canyon ride, and whether I might need to stop at home afterward. But I was feeling good, and so I decided to extend my ride so I could sync up with my friend, Joni, when she would be arriving in downtown LA., a good 8 miles away. Riding in to downtown would also give me a chance to check out Birdies, another donut shop on the LA Times list. I began to realize my timing was off, and that I would get to downtown far too early, so I figured I could head south a bit before heading east. This seemed like a good time to explore the east end of the Expo Line Bike Path, which opened last year. Although I’ve ridden it many times, I had only taken it from La Cienega west to Santa Monica. When I got to the La Cienega Expo Line Station, I was dismayed to realize that the skinny little bike lane I had seen on Jefferson Blvd IS the east end of the Expo Line Bike Path. The part of the new bike path I’d been on is a paved and mostly-off-street path as it follows the Expo Line through Culver City, west L.A. and Santa Monica, but apparently they were not able to make it as nice for the rest of the route. The Expo Line “Bike Path” is that skinny little bike lane alongside the tracks. So I took that skinny little bike lane all the way to the University of Southern California (USC), cut through the USC campus, and on into downtown. Once I got to Birdies, I was pleased to see that, once again, I was able to lock my bike to a good rack right in front of the donut shop. At Birdies, I wanted to try the pistachio-lemon-thyme donut that was mentioned in the LA Times. I also got a cute panda donut that I figured I could deliver to Joni when I met her, or perhaps take home to el Cochinito. Joni had mentioned not wanting to be late for a 4 pm concert, so I figured I could bring her a donut, in case she did not have time for a donut run. The pistachio lemon thyme donut was a bit disappointing for me, as it tasted very strongly of lemon, and I could not really taste the pistachio or the thyme. I would have preferred more balance to the strong lemon flavor. The mocha I had to drink with it, however, was quite good. I thought I had a little extra time before meeting Joni, so I planned out a little loop around downtown. As I headed northeast on the Olive Street bike lane, however, I heard a little plop sound. I turned around and saw that, sure enough, my box with the panda donut had fallen off my rear rack. My bungee cord was not holding it securely enough. So, I turned around and walked my bike back to where the box was sitting in the middle of the bike lane. Then a Prius pulled into the bike lane, heading straight for my donut box! I waved my arms, then put my hand up out in front of me, and screamed to the driver, “STOP! !” The driver initially stopped, and looked at me quizzically. I glanced under her car and was relieved to see that she had not run over my box; it was pretty much under the center of her car. I started to walk toward the car, intending to lean down and try to get the box, except I wouldn’t be able to reach it. I tried to tell the driver to please wait while I retrieve the box, but she never opened her window, and I suspect she just thought I was insane. Perhaps she was frightened by the hysterical cyclist walking up to her car, or maybe she just didn’t get it. She started driving again, and promptly ran over the donut box with her rear tire. I screamed at her as she drove on, seemingly obvious to the damage she’d done, and apparently also oblivious to (or unconcerned about) the illegality of driving in the bike lane. I picked up the partly smushed box and peeked inside. The panda donut was rather disfigured, but not squished. It didn’t look like much of a panda any more. It hadn’t gotten dirty, though, so I figured I’d still keep it, if only to help me tell the story. I secured it back on the rear rack, or so I thought. One block later, I heard the plop of the box hitting the pavement yet again. This time I was able to retrieve it without incident, although it was beginning to seem like a pointless effort. Just as I was fumbling with the bungee cord and the donut box and my jacket and the bag with the bloomers, a nice woman, who’d apparently been watching from the sidewalk, walked over and handed me a plastic shopping bag. I put all of the items inside the bag, and that made it easier to get everything secured under the bungee cord. She not only helped solve my luggage problem, she restored my faith in humanity. I thanked her profusely. As I proceeded on, I noticed the time, and decided I had better drop my planned loop and head over to the Pico station where the Expo Line train was bringing Joni into downtown. As it turned out, she had more time before the concert than I thought, so we decided to make it a triple and check out Astro Doughnuts, another shop on my list. Alas, our hopes were dashed when we realized that Astro closes at 3 PM, so it was back to Birdies. Joni wanted to try something else from their menu other than the chocolate cake donut that I had offered to her in the form of a cute little panda. She chose an adorable horchata dulce de leche glazed donut. We visited while Joni got her donut fix, and then parted ways afterward, Joni off to her concert, and me tired and ready to go home. Control #5 was sandwiched between a planned social ride and a screening of short films about adventure cycling. My friend Jennifer was doing both the social ride and the film screening, and agreed to join me for the in-between trip to Astro Donughts & Fried Chicken in downtown LA. 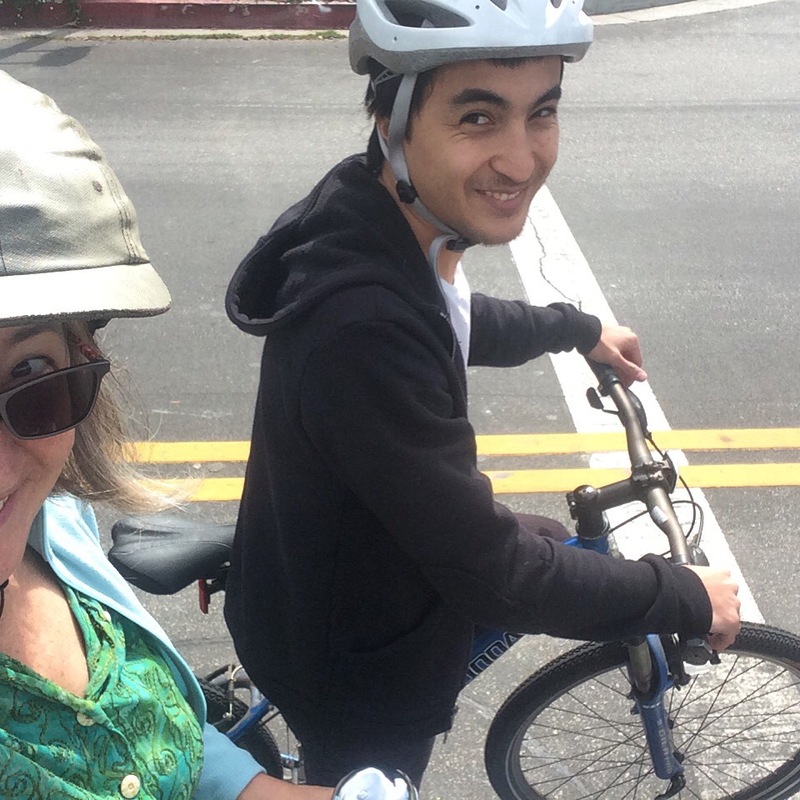 The social ride was part of a monthly series offered by the Los Angeles County Bicycle Coalition (LACBC) called Sunday Funday rides, each a themed ride exploring a different part of Los Angles County. 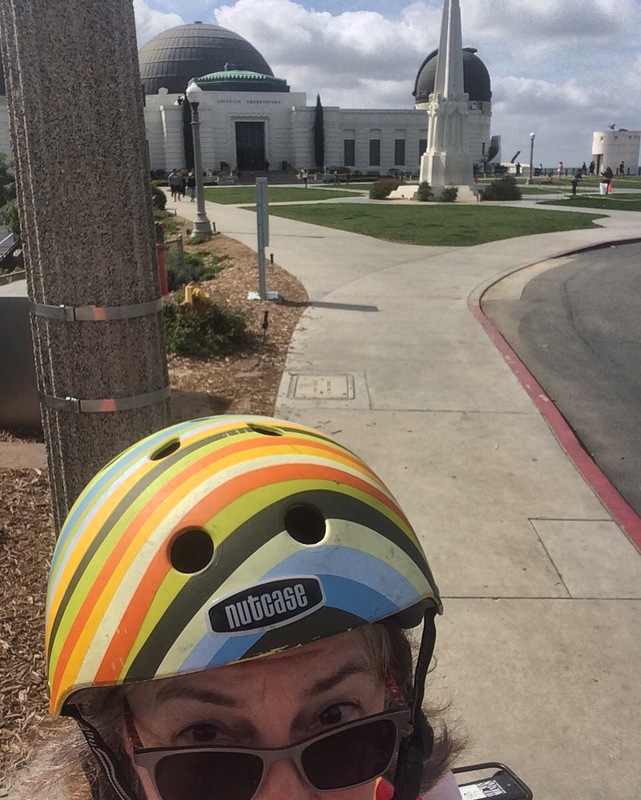 This one started at Exposition Park, near the University of Southern California (USC) campus, and took us to and along the Expo Line Bike Path that opened in 2016, with a stop in Culver City, and our final stop in Cheviot Hills. Several of us opted for the full route, which meant riding back to Expo Park from there. By this time, I’d ridden about 25 miles, and worked up a serious appetite. But we weren’t that far from downtown, so Jennifer and I continued on to Astro Doughnuts. They had great bike parking right in front, so we locked up and got inside just before closing time. Luckily, they still had both donuts and chicken available, and Carlos and Eddy served us with a smile. I had an excellent nitro cold brew with my unbelievably divine creme brûlée donut as well as some fried chicken. I was very hungry when we got there and quite stuffed when we left! We rode on from there to the Filmed By Bike adventure shorts being presented by Bicycle Culture Institute at Boomtown Brewery in the arts district. Despite being full, we were still able to enjoy some beer, as well as some inspiring films. Control #6 was also sandwiched between a social ride and an evening event, but this time I did not include the 14.6 miles of the social ride in my coffeeneuring mileage, since I took a short break at home in between rides, and changed to a different bike. But I did once again bring along a friend from the social ride to join me for the coffeeneuring ride. Joni (the same one who went to Birdies with me as part of Control #4) had been on the Flower Power Ride that morning, which took place in downtown Los Angeles, and featured a visit to the L.A. Flower Market, followed by lunch at the Bread Lounge. 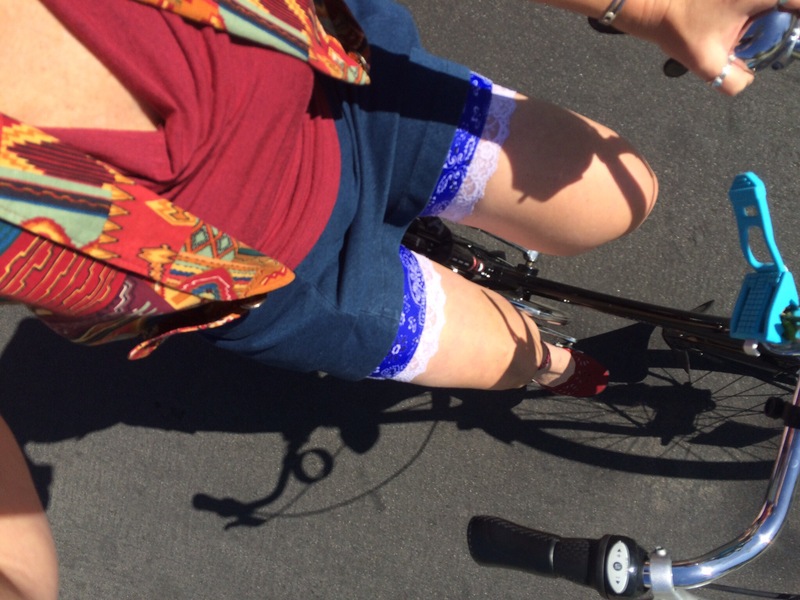 In keeping with the theme of the ride, I wore my Crazy Daisy Bloomers. Joni is familiar with the donut shop I was planning to visit, Sidecar Donuts & Bakery in Santa Monica, and was interested in joining me. She wanted to visit a market near my house, and I wanted to stop at home to switch bikes, drop off the flowers I’d purchased, and coordinate my evening plans with el Cochinito. We then took a fairly direct route west, first along the Venice Boulevard bike lane, and then hopping onto the Expo Line Bike Path into Santa Monica. Sidecar Donuts also has bike racks right out in front. Once we went inside, I again faced too many good-looking donuts to choose from, so I bought a box of four. I knew I had to try the huckleberry donut, which was highlighted in the LA Times article, and is unique to this donut shop. I also got the carrot cake, butter, and cinnamon crumb donuts to take home for breakfast the next day. Joni got the pumpkin spice donut, in large part because she caught one that had just been cooked. Since it was getting close to 6 pm, I didn’t want coffee, and opted for a steamed milk, which went nicely with the donut. From there, Joni went on home, and I rode over to the nearby Ingo’s Tasty Diner, and met up with el Cochinito for dinner before the two of us headed on to hear a panel discussion on racial justice at the UU church in Santa Monica. Afterward, we put my bike in the back of his truck and drove home together. For my final ride of the 2017 Coffeeneuring season, I rode to Kettle Glazed Doughnuts in Hollywood. This one was a bit disappointing, mostly because I don’t like biking in Hollywood, and the donut experience wasn’t good enough to compensate for that. 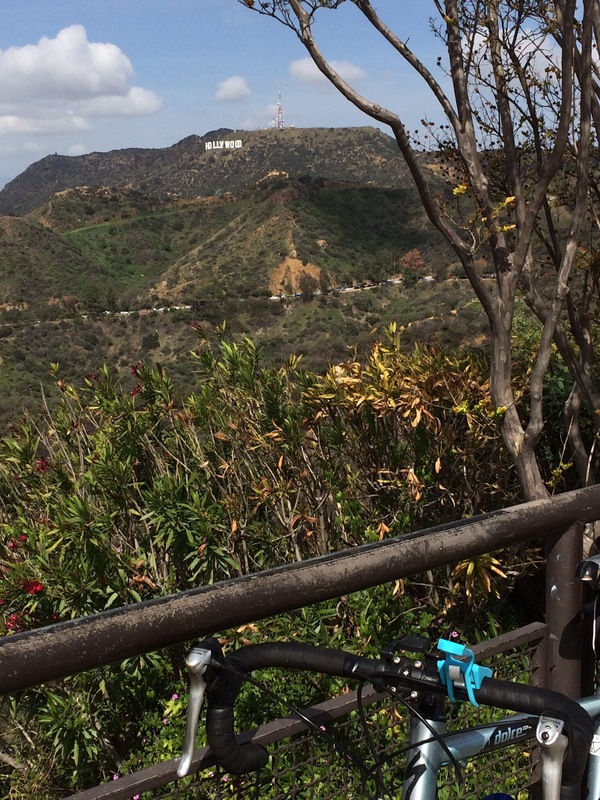 There’s something about Hollywood that makes me want to like biking there. Perhaps it’s the landmarks, or maybe knowing that it has that rough quality that reminds you of all the people struggling to get by in this area and makes you think it should be bike-friendly, or maybe just because there are plenty of otherwise worthy destinations within a reasonable biking distance from my home that make the idea recur on a regular basis. It’s not all bad, either. 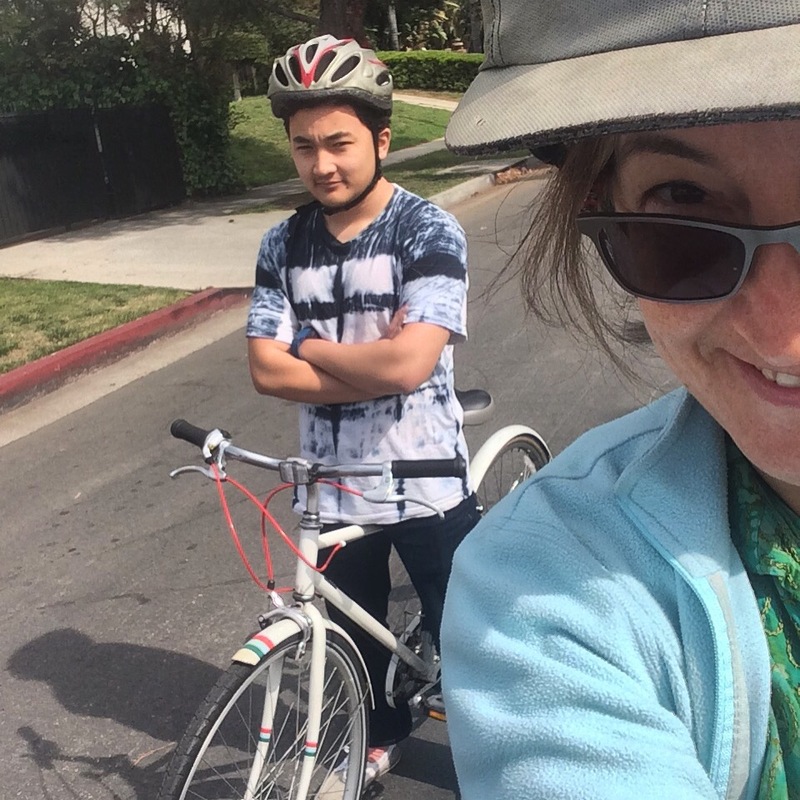 I’ve had reasonably pleasant experiences biking to the Hollywood Farmer’s Market, and that is close to the Arclight Cinema there, where el Chochinito and I like to see movies from time to time. But anything outside that zone seems to be hard to access without having to venture on streets that leave a cyclist feeling quite exposed. I knew enough not to take the first route suggested by Google maps – straight up Vine. I think the only reason Vine street is considered “bike-friendly” is because it has sharrows and it’s the best north-south street for getting through Hollywood. Unfortunately, it’s also what most motor vehicles use for north-south travel through Hollywood. Instead, I much prefer to take Rosewood west a wee bit, and follow it as it turns north and becomes Wilcox. But today, my destination was on Franklin, which is way north into Hollywood. I used Yucca to go east from Wilcox to Argyle, passing the iconic Capitol Records Building. Sure, there were sharrows and signs asserting that this is a bike route, but it sure didn’t feel like it! It doesn’t help that Yucca is plenty wide, and invites speeding cars to do their thing. Argyle then crosses under the 101 freeway to Franklin, and there sits the strip mall that is home to Kettle Glazed Doughnuts. I got to Kettle Glazed after having to navigate a left turn mid-block, crossing heavy traffic in both directions. I scanned the parking lot of the little strip mall, and realized that, even if there were a bike rack around, I probably would not want to use it. A homeless guy was busy retrieving items from the dumpster, and had an air about him that made me think he considers himself the owner of the parking lot. There really wasn’t anything that looked like I might be able to lock my bike to it, anyway. I decided to see if I could take my bike inside. The shop is small, and another bike was leaning against the one area of open wall space. I decided to lean my bike against the trash cans by the door, but locked it and took my pannier with me, since it was so close to the entrance. There was a nice variety of donuts that looked worth trying. I like a classic old fashioned donut, and theirs looked good, but I wanted to try their specialty, the kettle glazed croissant style donut. They offered their cronut with either cinnamon or chocolate on top. How was I supposed to choose between those two? Once again, I had to get one of each, and take the second half of each home to el Cochinito. To go with it, I had a cup of coffee, which was entirely unspectacular. They pointed to an insulated pump dispenser. At least this time, the last of my seven rides, I finally remembered to bring along my own coffee cup, rather than use another throw-away cup. This environmentally friendly idea had been suggested to the group by a fellow Coffeeneur, but I had trouble remembering to bring a cup along for each of the preceding trips. 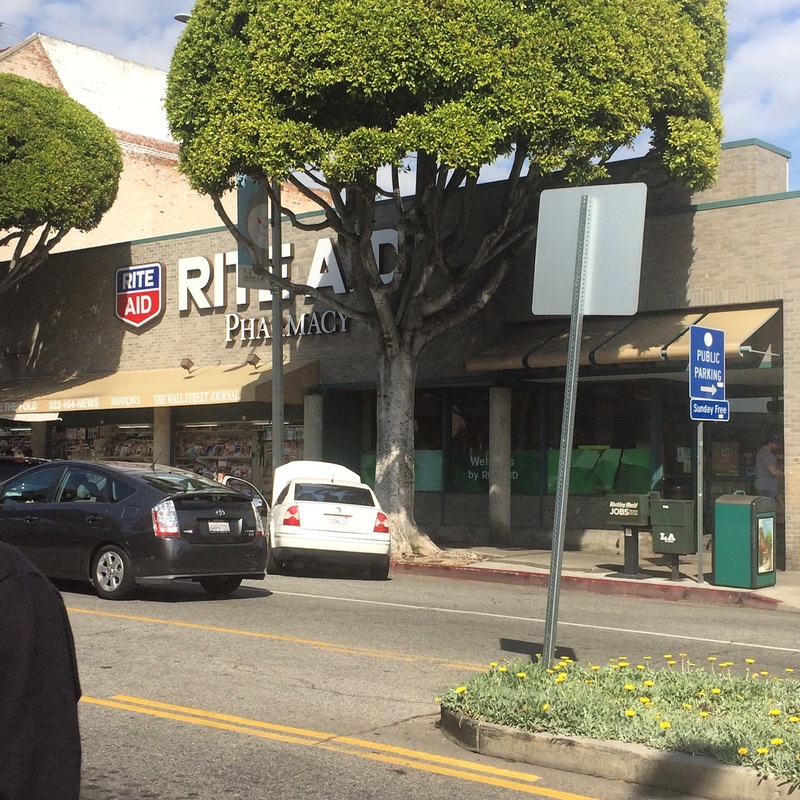 Since I was so close to the Hollywood Farmer’s Market, the biggest and best in L.A., and close to the Bed Bath & Beyond store, where I wanted to pick up a few things for the house, I headed south on Vine and turned it into an errandonnee trip as well. I ended up getting so much at Bed Bath & Beyond (that beyond part always gets me! ), there wasn’t room on my bike to add anything more from the farmer’s market. So I headed on home from there, at first trying to make peace with Vine Street, but eventually turning off onto side streets and cutting over to Van Ness, another street I find much more bike-friendly (and pretty) than Vine. And with that, my seven coffee (and donut) stops by bike were completed. Of course, the LA Times article listed 29 donut shops, flung far and wide across the extended Los Angeles area. I only made it to seven of them, and I’m still curious to try several more. I’ve had so much fun with biking for donuts, and I particularly enjoyed doing these adventures with friends, that I’m now planning an epic donut ride for New Year’s Day. My tentative plan is to start in Venice at Blue Star donuts, and work my way east, all the way to The Donut Man in Glendora, nearly 50 miles from Blue Star. It just so happens that 3 more of the donut shops on my list are positioned in between these two, each about 10 miles apart. We (that’s including anyone who cares to join me for this adventure) can bike the whole way, and then be full enough to require no more fuel stops for the ride back, which can start out along the San Gabriel River Trail, and the Duarte Trail, providing some variety for the return trip. Those not interested in biking more than 50 miles, can hop on the Gold Line at the Azusa Metro Station, which will get them to Union Station in downtown, providing access to the Venice bus, which runs all the way from downtown back to Blue Star, if needed. As is apparent, the Donut Quest is never ending! 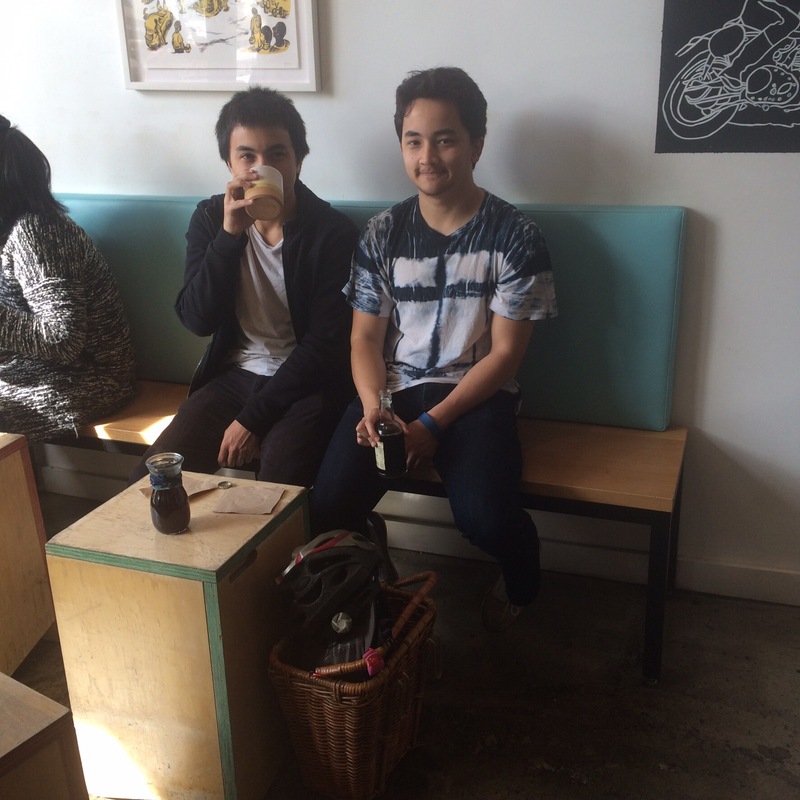 If you’re ever in Los Angeles, and want to bike for donuts, message me and we will take it from there. P.S. 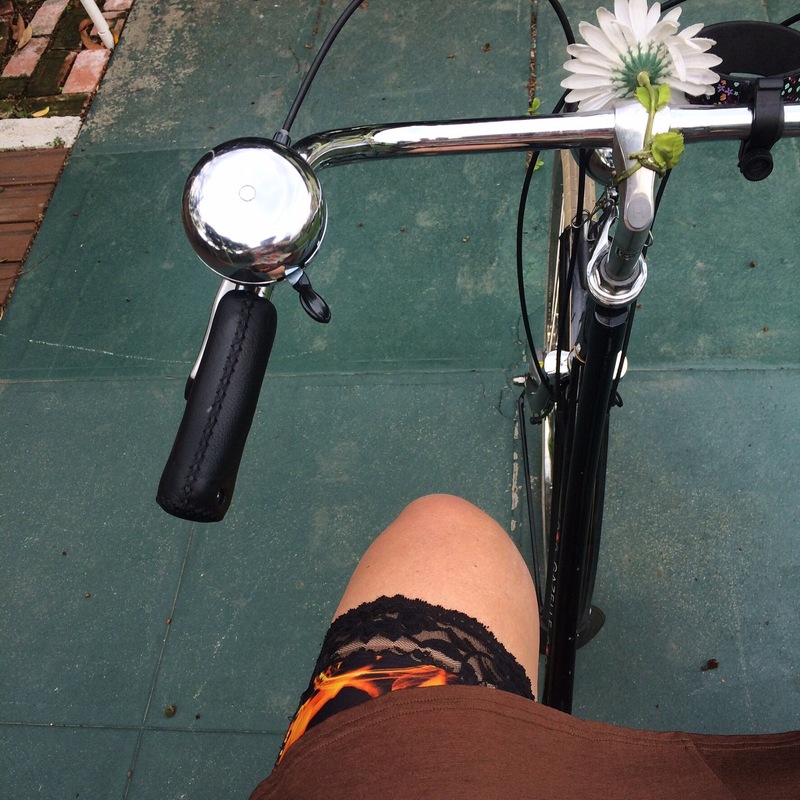 Interested in outfitting yourself (or a friend) with something from the Bikie Girl Bloomers collection: Treat yourself to the special discount for Coffeeneurs: use code COFFEENEUR to get 15% off an order of $50 or more. Last year, I took my first stab at the Errandonnee Challenge, a 12-day event during which participants perform 12 errands in at least 7 different categories by bicycle, logging a cumulative total of at least 30 miles. It’s brought to us by Mary of Chasing Mailboxes, the same shero who keeps us pedaling in the Fall with Coffeeneuring. For those of us unlikely to take up randonneuring, it’s a great way to embrace the sport in a manner that easily fits into our everyday lives. No need to train for hundreds of miles, nor to stay awake all night. Precisely because I use my bike for commuting and errands on a regular basis, I seriously underestimated the challenge last year. This time around, I was able to up my game a wee bit, by applying a few lessons learned. Of course, last year, the Errandonneur-in-Chief had mercifully granted us two weekends within the dates of the challenge. I remember being grateful for that since I was committed to the Seattle Bike Show during the opening weekend and, ironically, being a vendor at that event means I have to use a motorized vehicle to haul my pop up shop supplies to and from the venue, with no free time to sneak off and ride a bicycle. (It has been a sad realization that starting a side business related to my passion for urban cycling has been a major destroyer of opportunities to ride my bicycle.) 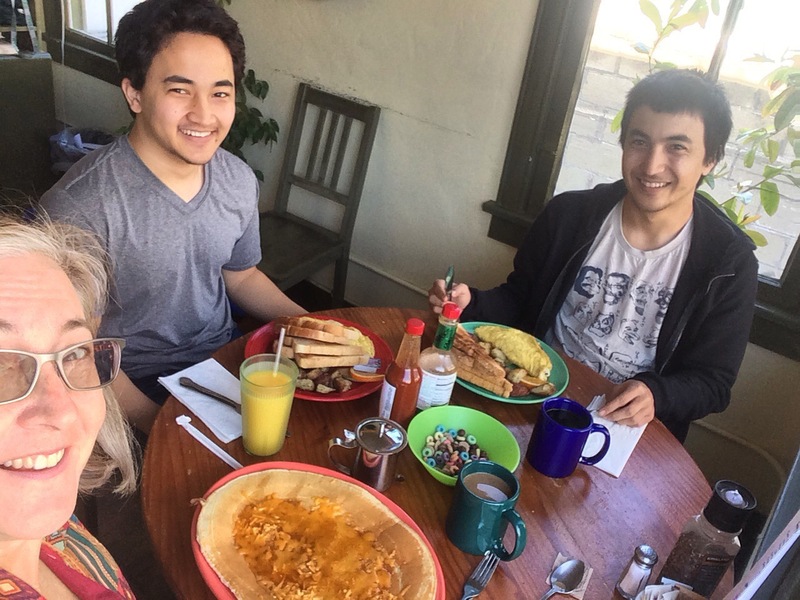 I also remember that my sons were home for Spring break during the 2016 Errandonnee, and cheerfully tagged along for some of the rides. Even with the bonus weekend, I ended up scrambling to fill my control card last year. For 2017, I knew better. I was going to be organized! The announcement of the event dates came a little late this year, perhaps owing to the Errandonneur-in-Chief having a life to live and all that. It appears the scheduling of the event may have been simply a matter of practical considerations. The event was announced on March 15th, with the dates set for March 20th-31st. In other words, just in time to end before the grand international #30daysofbiking, which always runs from April 1st to 30th. No problem, even with just one weekend in there. Oh, except my darling husband had just very thoughtfully booked a trip for us to Seattle that weekend. That should pose no problem, though. There are bicycles in Seattle! Except the point of the weekend was to visit family and spend some time together while hubby is on Spring break and before he heads off to Cuba (again). Well, it’s only a weekend. I still have plenty of other days during which to complete the challenge, and besides, this year I’m organized! To make sure I wouldn’t end up in a pickle, I carried a note card with me. On one side of the card, I kept a running list of errands I could think of that needed to be done. As each errand was completed, I added it to a numbered list on the other side, and made a note of the categories under which that errand might fall. I also noted my mileage there, as I’m well aware that most of my errands are quite short in distance. I then looked at my calendar, and figured out which days would work for which errands. Last year, I got my mileage in with my weekend recreational ride to Griffith Park, but that wasn’t going to be possilbe this year. I decided to use my need for mileage as a motivator to follow through on a maybe-someday-I’ll-check-it-out idea of going to a DraftLA Meet Up scheduled for March 30th at a bike shop in Burbank. The Draft Meet Up are a new series of gatherings organized by People for Bikes to bring cyclists, advocacy groups and bike industry people together in a social setting. The rules of the Errandonnee (because it wouldn’t be an errandonnee without rules) require no more than two errands in each of the nine categories, and at least seven different categories must be included. There is no minimum mileage for each trip, but the total over the event must be at least 30. 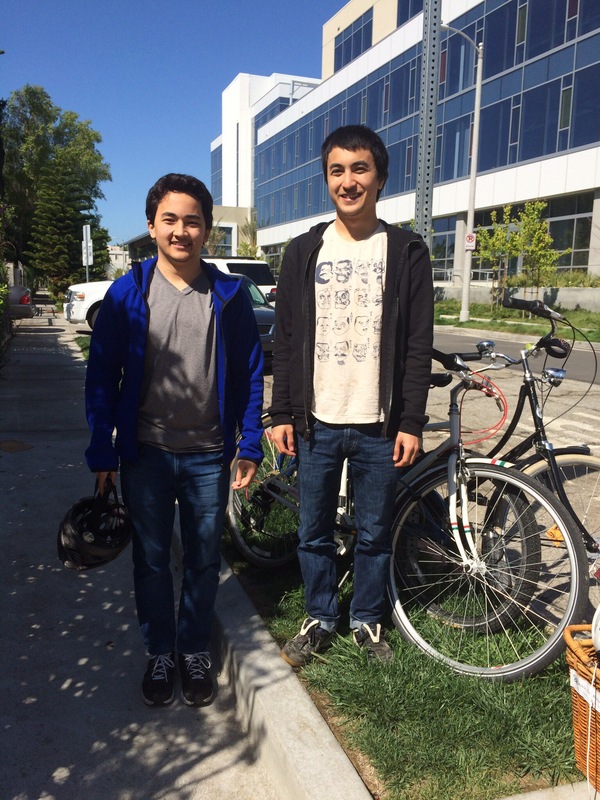 For each errand, a photo must be taken to show that the errand was taken by bike. Finally, for each errand, the participant is to share one observation or something that they learned from that outing. You carried WHAT on your bike?! Now, I can’t seem to approach something like this without invoking a theme. This year has been a heavy-hearted one. My mother died suddenly in October, and I am still processing this grief. She was a big fan of my bike adventures, an enthusiastic supporter of my Bikie Girl Bloomers, and loved to follow along as I posted photos and stories on Facebook. She wasn’t a cyclist herself, but encouraged my love of it, and even got me doing my first bike tour, Ride the Rockies, back in 1986. When Mom would call me, she’d always begin the call with, “So where are you now?” She’d say she just couldn’t keep track of my travels and whatever was on my schedule. Since her passing, I have felt her presence with me, and find that I particularly enjoy wearing something of hers as a way to enhance that feeling that she is riding along and enjoying my adventures with me. So I decided that I would include in my report the item of hers I wore each day of the event to honor her memory. 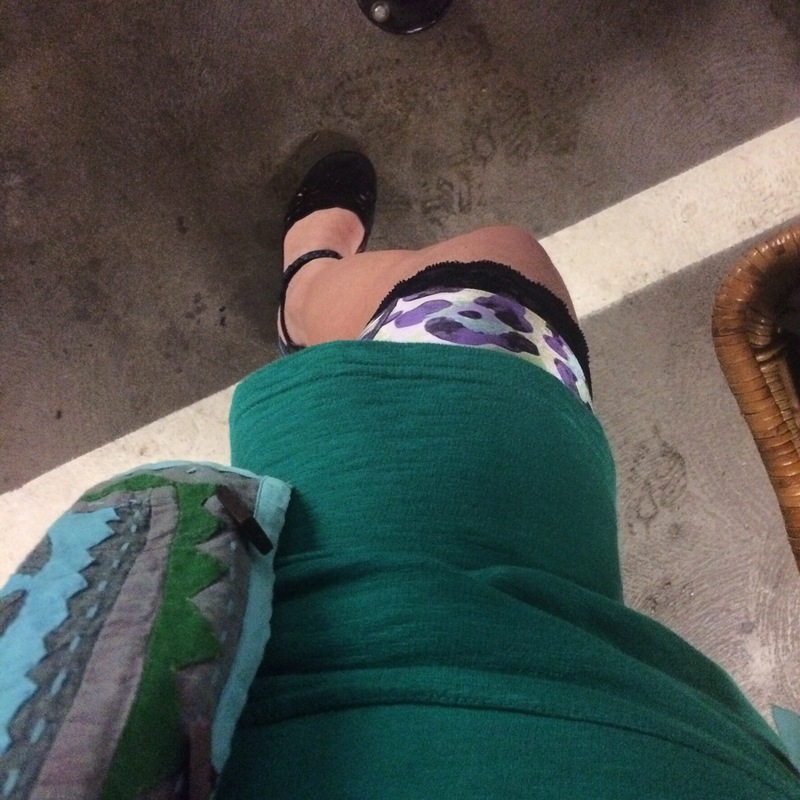 Plus, I have to include in my report the bloomers I’m wearing that day, because, that’s my thing. Remembering Mom by wearing: A pretty purple scarf she brought back from India, back when she was Director of Development for a charity hospital in Vellore. Observation/Lesson: Riding through the wide, tree-lined streets, past the grand historic homes of Hancock Park makes me feel like I’m riding through a movie – it’s too idyllic to be real. Surely everyone would bike to work if they could do it this way! Observation/Lesson: I wasn’t sure if my package would be delivered. Doesn’t the USPS have some rule about requiring packages be left at the counter of the post office or something? I was happy to see confirmation that my package did make it to its destination. Remembering Mom by wearing: Her raincoat. I found this white raincoat in her closet. It looked so pristine, as if it had never been worn. Might she have received it as a gift? Was it new? Now that I know white is a color associated with the suffragette movement, it feels rather special. It’s a nice lightweight coat very suitable for the kind of light rain we get here in Los Angeles (when we’re not in a drought). Observation/Lesson: Normally, I get mildly annoyed when I receive a check that is for an amount just a nudge above the limit for mobile deposits. This time I was thrilled to find myself tasked with an unexpected errand, just at the right time! The errand resulted in disappointment, however, when I discovered that the ATM was “not accepting deposits at this time”. I get that sometimes an ATM can’t dispense cash, but hadn’t realized that sometimes they can’t accept deposits. 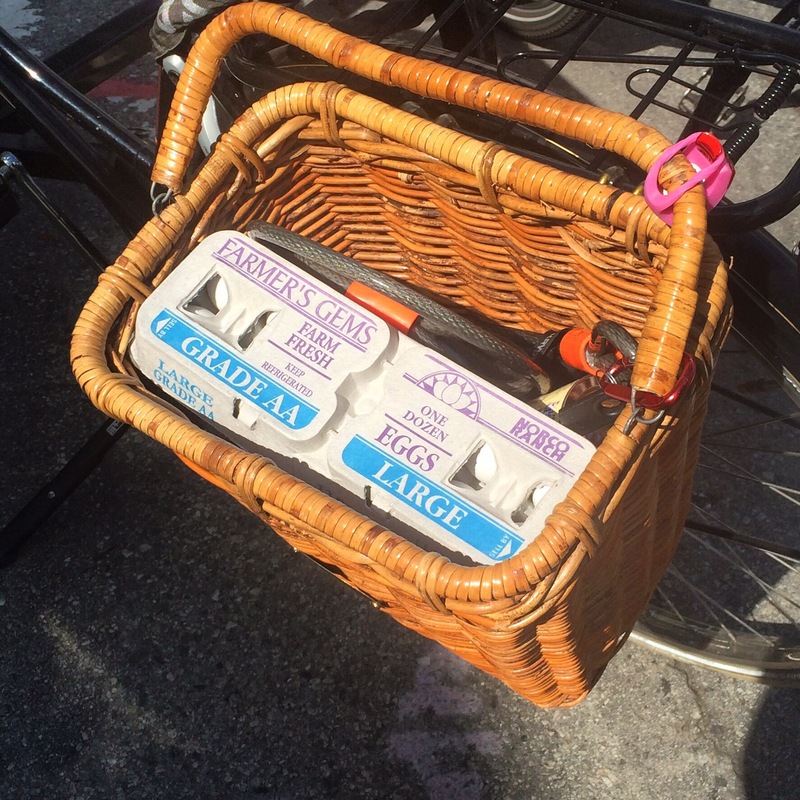 So my errand was a fail, but the Errandonneur-in-Chief informed that it still counts. Phew! Remembering Mom by wearing: Same raincoat. Observation/Lesson: Some businesses are so good-natured about letting customers bring their bikes inside. There were no bike racks near the entrance, but they waved me in with my bike! If you look closely enough, you can see raindrops on my glasses. Remembering Mom by wearing: Same raincoat – going for a triple today. Observation/Lesson: Riding in the rain gives me a small sense of legitimacy in the Errnadonnee. I read about others biking their errands in foul weather, and it makes me feel a tiny bit guilty. We have it so easy with our gentle weather here in Southern California. But it’s only a small sense of legitimacy today, as the rain is quite light and manageable. Just enough to justify the raincoat. Remembering Mom by wearing: Another scarf from her colorful collection. This one is a pretty batik of jewel tones. Observation/Lesson: Today my deposit was accepted! And I am getting better at managing the challenge of getting my bike inside the ATM cage with its rather heavy door. That funky building is the Mark Taper Foundation Imaging Center. Remembering Mom by wearing: Same scarf with the pretty batik of jewel tones. Observation/Lesson: I didn’t know why I had been putting off the mammogram that was more than a year overdue until I saw the announcement of the 2017 Errandonee. I just needed something to make me get excited about taking time away from work to run an errand! Destination: The home/office of my production manager for Bikie Girl Bloomers, where I delivered two spools of quarter-inch elastic and two bags of garment labels (leftover from prior productions) to be used in the new styles of bloomers. Remembering Mom by wearing: Same day, same scarf with the pretty batik of jewel tones (another triple errand day). Observation/Lesson: I don’t understand what Google Maps thinks is a bikeable street. There were a few stretches on this route where I felt the sidewalk was my only safe place to ride, and I don’t normally think it’s wise to bike on the sidewalks. Fortunately, most of the ride was quite pleasant, as urban cycling goes. 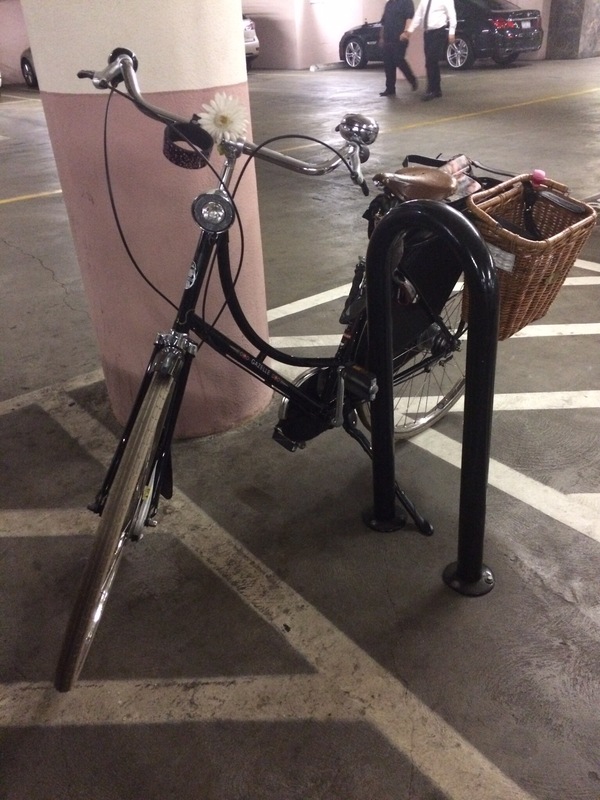 Instead of locking my bike to the shopping cart corral near the entrance, I used the bike rack that is inconveniently placed on a narrow sidewalk. Remembering Mom by wearing: Her red earrings that look great with the beautiful red blouse my sister gave me during our visit to Seattle. Observation/Lesson: I was feeling so refreshed from an enjoyable weekend out of town, I was actually excited to plan dinner and run to the store for fresh ingredients. I bought some salmon to bake in parchment paper. If you haven’t tried cooking salmon this way, you are really missing out! Category: You Carried What on Your Bicycle? Remembering Mom by wearing: Her fuzzy purple jacket. Observation/Lesson: This was another errand that had been put off for months, apparently waiting for Errandonnee season. I don’t have that much clothing that requires dry cleaning, so I tend to let it pile up. This was about six month’s worth: 4 jackets, one pair of slacks, two blouses, and a scarf. 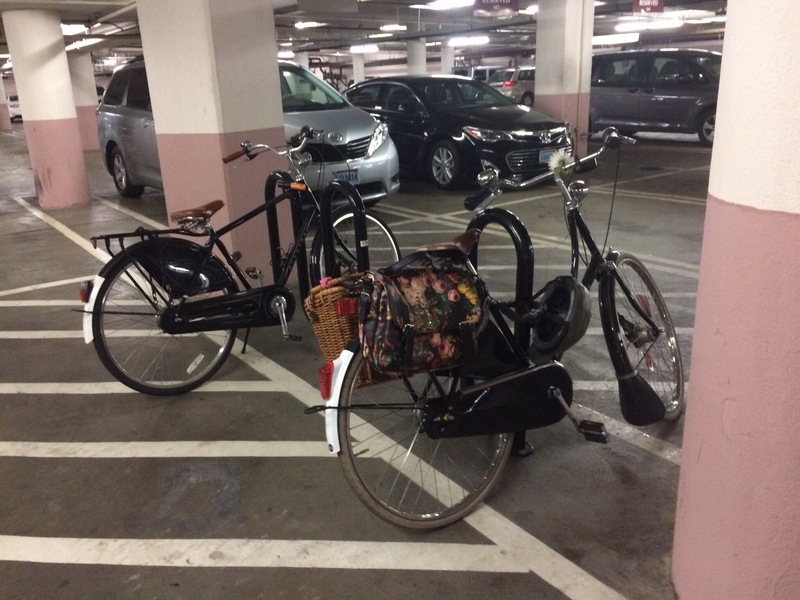 I piled them into a bundle, laid them over the rear rack with as much of the bulk in the pannier basket, and bungee cords holding the bundle in place. 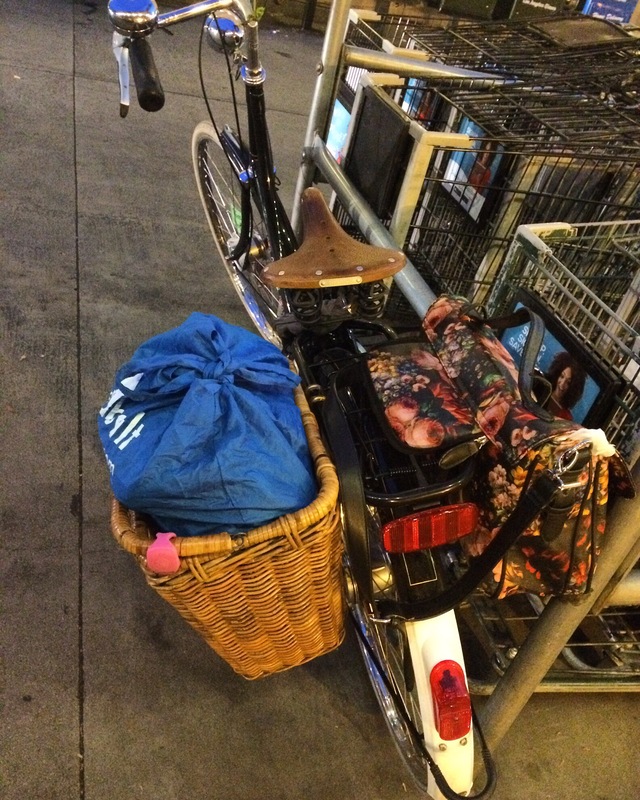 It was quite a lopsided load, and the bike would easily fall over when parked, but I only had to go 4 blocks. The hard part was taking a picture. I had to lean the front wheel against a building to keep the bike upright. Remembering Mom by wearing: Her other red earrings. Observation/Lesson: Noticed the big, beautiful Centennial Fountain across from the entrance to Griffith Park. I must have ridden past it dozens of times on my way to the park without noticing it. This time I was on the fountain side of the street, waiting to continue straight across toward the river path entrance (instead of turning left into the park). Remembering Mom by wearing: Her shoes. Observation/Lesson: It’s tough to stick to my carrying capacity when shopping for a party I’m hosting. Thank goodness for bungee cords! That gives me a total of 8 categories, and 42.2 miles! I have proudly earned my patch!